I hope you all are having a fabulous week, and if not, at least we're halfway through! 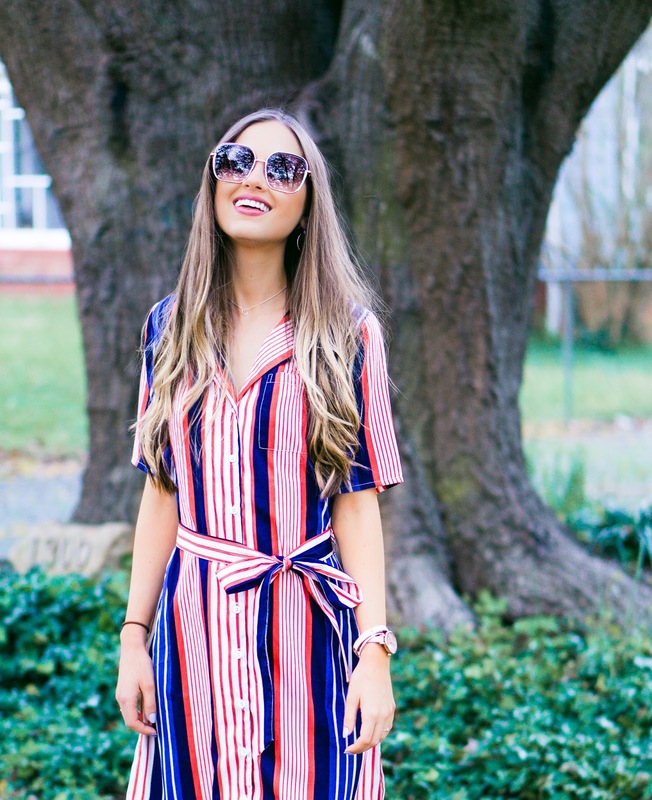 I wanted to share this striped shirtdress with you all because I am currently in love with it! A shirt dress is so easy to just throw on, while still managing to look cute and put together! I styled it with a pair of wedges, but it could also be styled with a pair of strappy heels for a date night look, or with a pair of sneakers or sandals for a casual daytime look. The red, white and blue colors really pop, so you can easily make a statement without wearing anything too outlandish or uncomfortable. Add some pretty jewelry and a pair of sunglasses, and you are all set for a pretty spring day! Enjoy the rest of your week friends and comment below telling me how you would style this shirt dress! Love this dress on you! Stunning! Thank you love! Enjoy the rest of your week! I am so obsessed with this look! You look SO beautiful!!! Thank you pretty girl! Lots of love! GIRL you are such a stunner!!! And perfect hair!!! Thank you pretty girl! You can never go wrong with red, white & blue! I love that this isn't your conventional striped dress! The vibrant colors make the look standout.